A few days ago I returned from a week in Northern England, where I walked coast to coast: from Wallsend in the east to Bowness-on-Solway in the west. 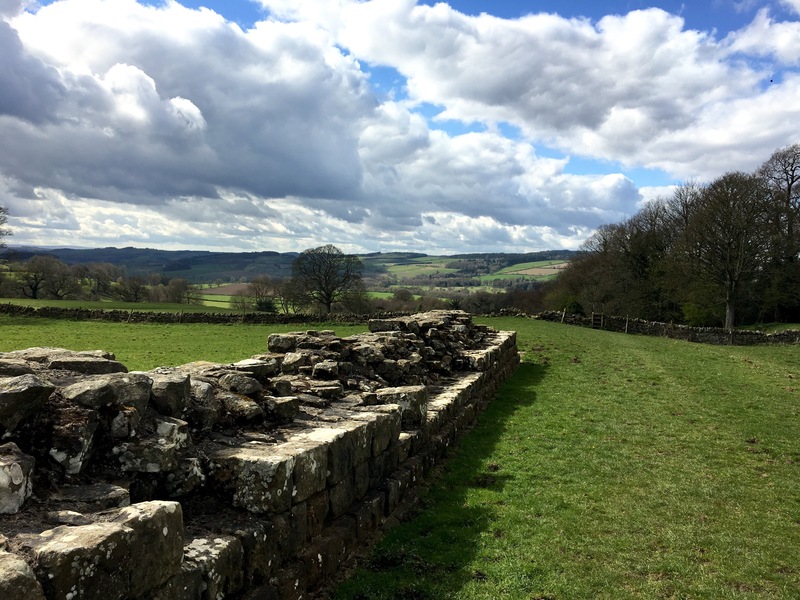 My route followed the length of Hadrian’s Wall, an 84-mile path that stretches across the most northern regions of England; at some parts of the trail and on clear days, you can see over to Scotland. 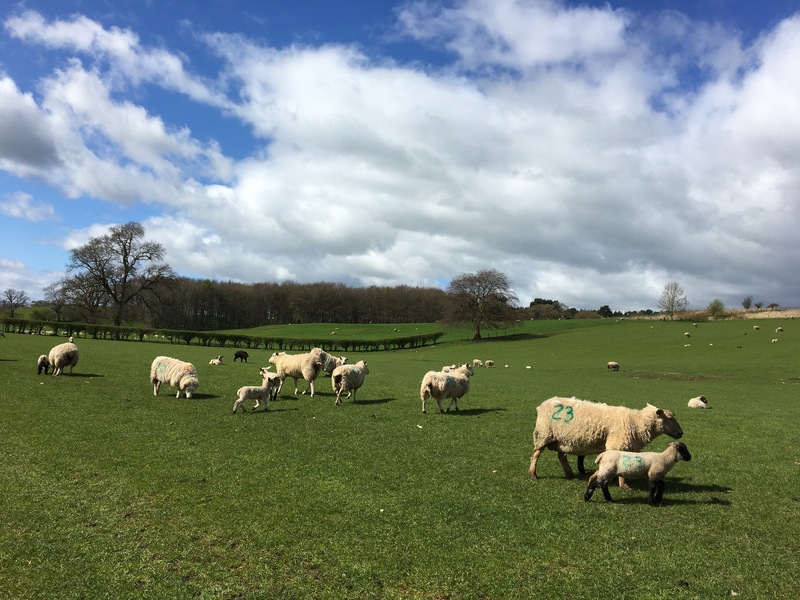 There was wind, there was rain, there was abundant sunshine and there were sheep. So many sheep. All in all, the walk was a resounding success. I thought, and hoped, to blog while I was there, but managing a blog post after a full day of walking on a solo-trip is hard enough, but it proved to be next-to impossible while traveling with a friend. I suppose I could have crept off to a quiet corner and dashed off some words, but given that the biggest draw of doing a walking adventure with a friend was to have some companionship in the evenings, I decided that the blogging would have to wait until I returned. I’ll write in more detail about each day of the walk, but for now, I want to start with more general thoughts. What is the Wall, exactly? Built by Emperor Hadrian in the 2nd century, it’s northern Europe’s largest surviving Roman monument, a fortification that stretches for 84-miles in the border country between England and Scotland. 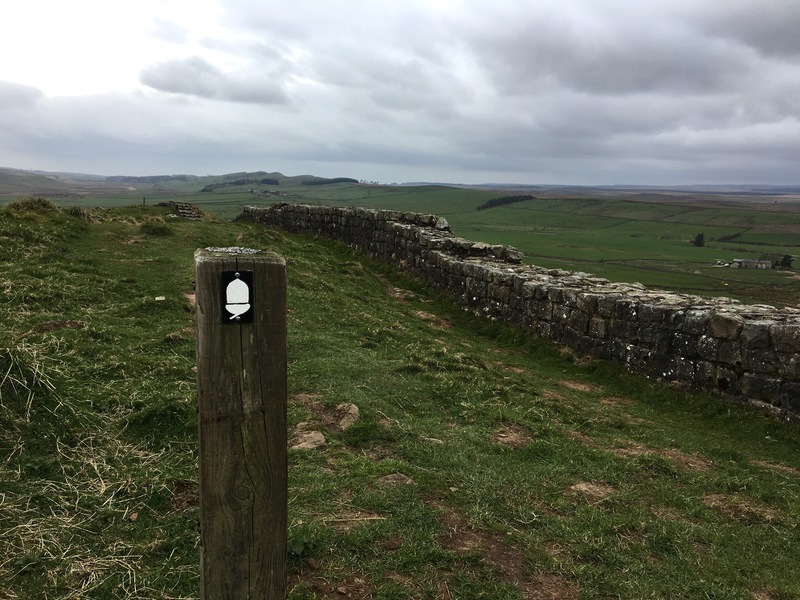 It is punctuated by the remains of milecastles and turrets and forts, and while only about 10 miles of the actual wall remain (and what is left doesn’t rise to even half of its original height), the remains are stunning and the path of this trail was so well designed that walkers rarely stray from the course of the wall. The trail opened in 2003 and the waymarking is good (look for acorns), with plenty of lodging options along the route. The scenery is diverse; the walk passes through the cities of Newcastle and Carlisle, through moorland and dale, and over undulating countryside. 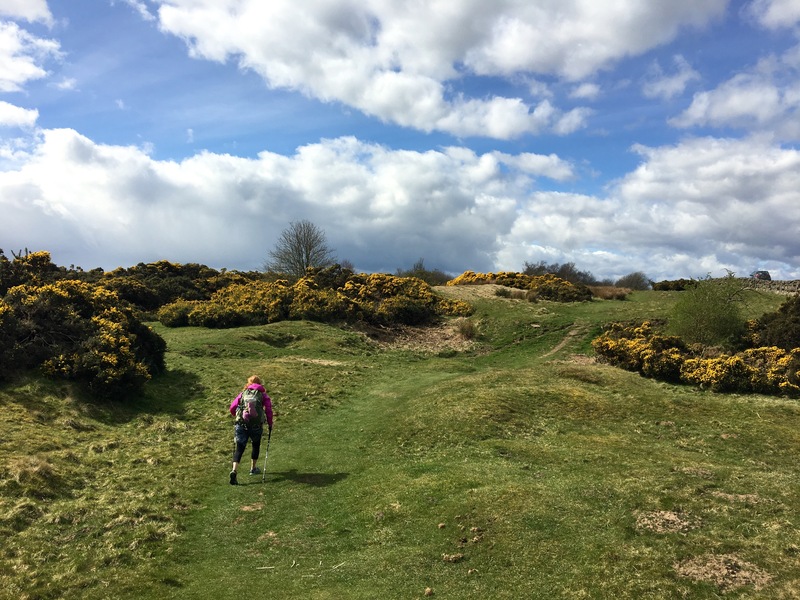 While one of the stages has a lot of ups and downs, overall the path isn’t considered too difficult (and, in fact, is the easiest of the UK National Trails). My spring break is just a week long, but I knew I wanted to squeeze in some sort of trip. I have ample time to travel in the summer and I haven’t stopped appreciating that for a second, but the 10-months in-between my travels can be long ones, especially those cold winter days. I needed something to look forward to, I needed a new adventure. With just a week, would I be able to complete a walk across England? Would early April be too cold, too wet, too muddy? A friend contacted me after she heard that I was planning this trip, and asked if she could come along. I agreed, excited to spend time with a friend that I don’t get to see enough, but also just a bit worried. What would it be like to walk and plan with someone else? Would I miss my solo adventuring? I found a few itineraries for 5-days along Hadrian’s Wall, and I began to research hostels and bunkhouses and B&B’s. 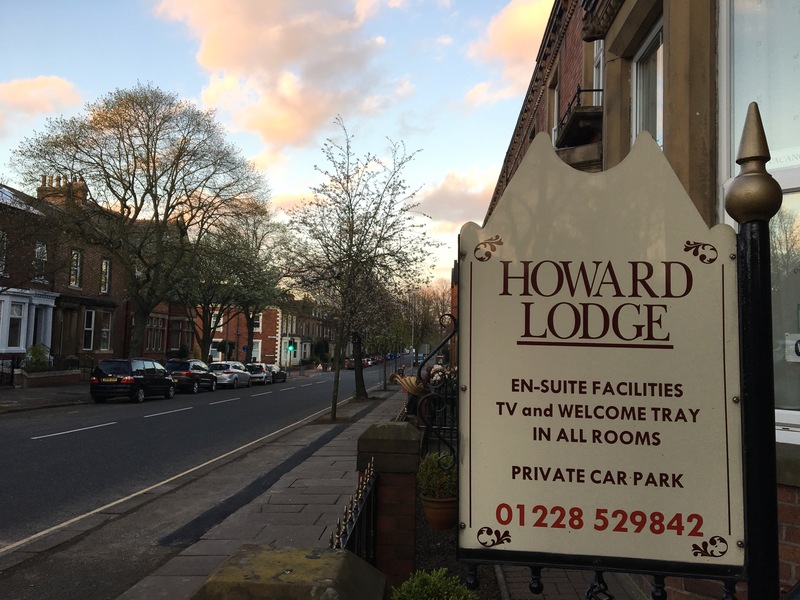 Despite being early in the season (the “real” Hadrian’s Wall season runs from the 1st of May until October), I decided to book lodging in advance. I worried that because we were early, some places might not be open, and with little flexibility in our tight time-frame, I didn’t want to have to scramble or skip sections of the route because we couldn’t find a place to stay. I began tracking the weather a month before we left, and was heartened to see that the weeks preceding our walk weren’t getting much rain. Maybe this means there won’t be much mud! I wrote to my travel companion, Heather. Walking in the cooler spring temperatures meant a couple of new additions to my “Camino” pack: a pair of rain pants, Crocs, a long-sleeved Merino wool shirt, a base-layer for my legs. I swapped my sleeping bag for a sleeping bag liner, since we’d be staying in bunkhouses and B&B’s that provided bedding. With two weeks to go, I began to hike in earnest, managing all the miles that I could. My longest training hike was 12-miles but without a full pack, and I worried that I was a bit out of shape. Do you think I’ll ever head into a trip without a head full of worries? Probably not. I’ve done this walking thing several times now, and while I am more confident, I don’t think I’ll ever be able to shake the nerves that come before one of these journeys. And maybe that’s best, because if these trips ever become too normal, too second-nature, then I’m afraid they’ll have lost some of their appeal. 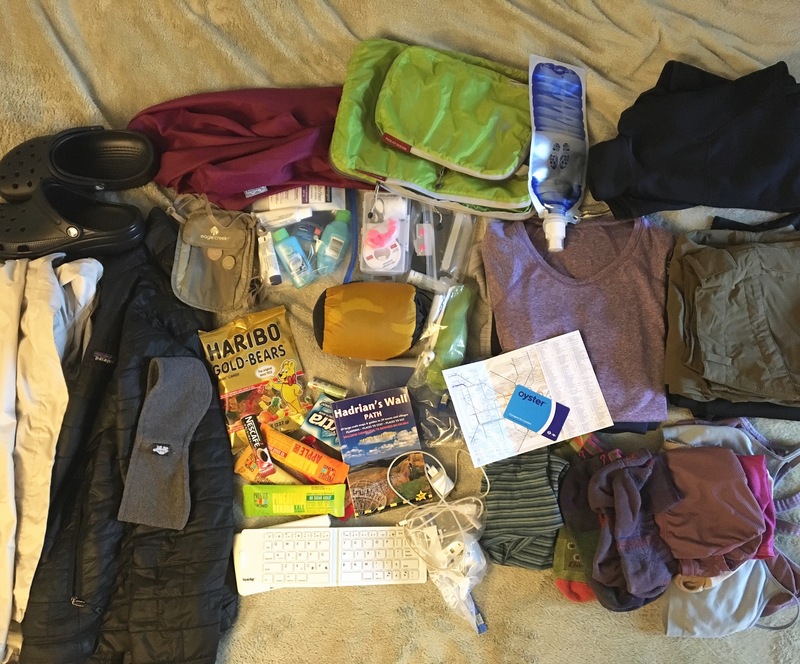 No, I hope that I always hold onto a bit of those pre-trip nerves: the questions about my gear and my pack, the panic about whether I’ve trained enough, the uneasy dreams (nightmares?) about blisters and rain. It adds to the adventure of it all. And this was, indeed, another adventure, even if it might have felt a little different because it wasn’t a solo trek. I could feel my excitement mounting as I boarded my flight, as I touched down in London, as I dug an old Oyster card from my bag, as I traveled the length of the Piccadilly line, as I met my friend at Kings Cross (by Platform 9 3/4, because where else would you meet a friend before a journey?). wow, 5 days walk! Looking forward to the next story about the walk. I told you that it would rain! Glad you enjoyed it and I look forward to hearing about it in more detail. But luckily, it was only a very little bit of rain! Our timing was good, and we got lots of sunshine… phew! Did you find any good coffee along Hadrian’s Wall? Best coffee was French press to start the day in the B&Bs and bunkhouses. But didn’t compare to the numerous cafe con leche opportunities of a Camino.